These free bracelet projects should spark your inspiration! Welcome to the bracelets projects page. 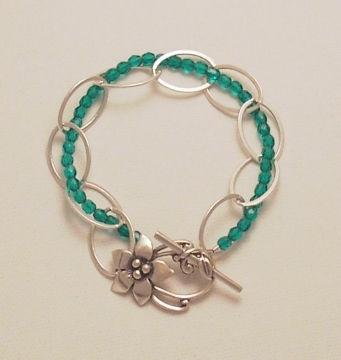 Make a bracelet and some complementary matching earrrings for a lovely gift set. 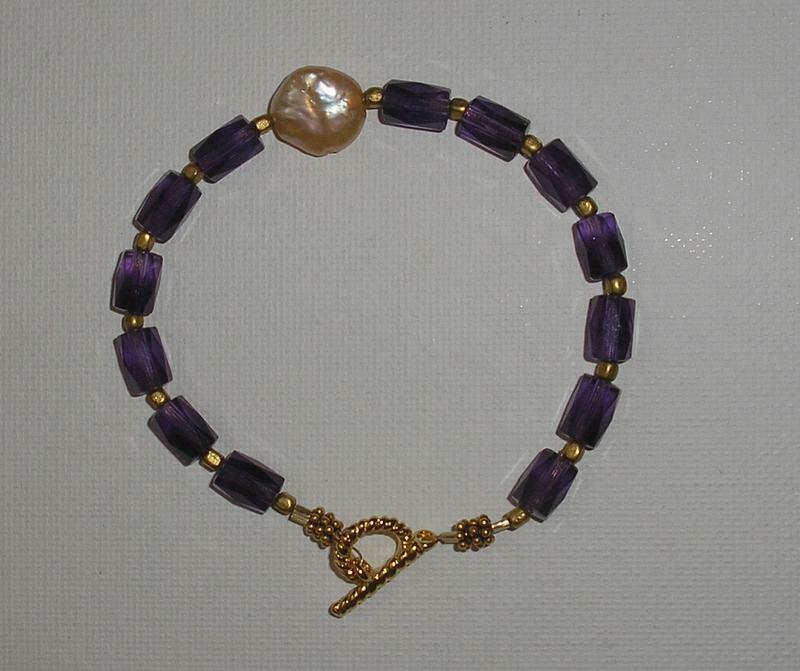 Amethyst Bead Bracelet with Coin Pearl Accent - Dark purple amethyst beads sparkle in this bracelet design idea, with an off-set coin pearl detail. 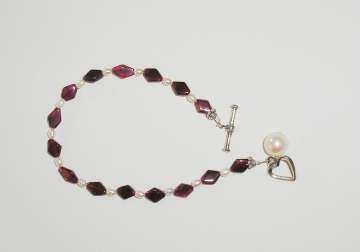 "Elegance" Garnet and Pearl Bracelet - Simple and elegant with a white pearl dangle and heart toggle clasp! 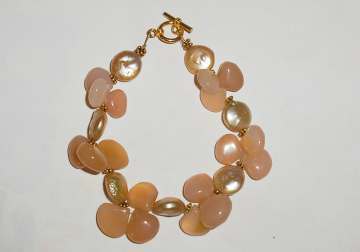 "Gemmy" Chalcedony Briolette Bracelet - A gorgeous combo with gemstones and pearls! 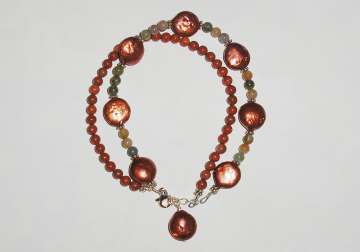 "Copper Leaves" Coin Pearl and Jasper two-strand Bracelet. Rich autumn colors are the inspiration for this one. 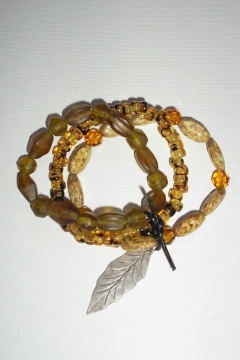 "Earthy" Stretch Bracelet Set - three stretch bracelets fastened together with a Hill Tribe silver leaf charm on leather cord. 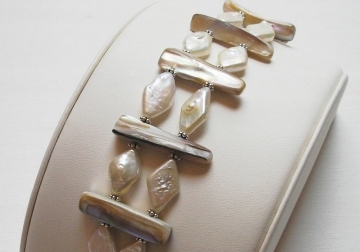 Summertime Pearl and Shell Bracelet - Featuring diamond shape freshwater pearls and shell beads. 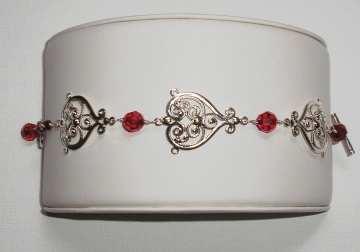 "Roses are Red" Red Crystal Filigree Bracelet - Made with sparkling Swarovksi crystals and silver filigree connector findings. 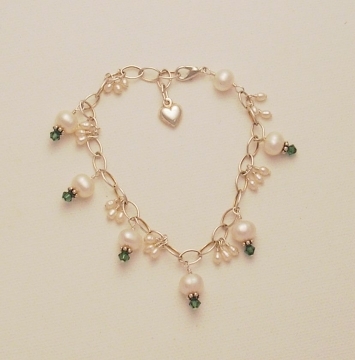 "My Kids" Birthstone Mother's Bracelet Make this birthstone crystal and pearl Mother's Bracelet. 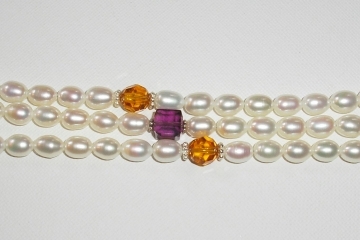 Design can be made with one or more strands accented by each child's birthstone colored crystals and freshwater pearls. 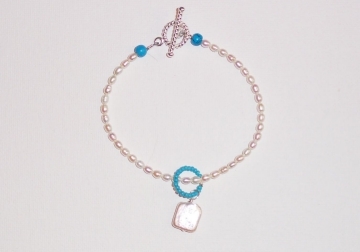 "New Mommy" Pink or Blue Baby Charm Bracelet with Swarovski Crystals - Create an instant heirloom Mother's Bracelet for mommy with sterling baby charms and sparking crystals and freshwater pearls. Perfect gift for the new mom! 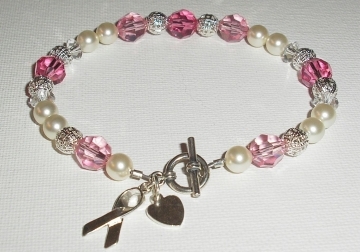 "Breast Cancer Awareness Bracelet" - Pink Crystal and Pearl bracelet with sterling silver ribbon and heart charms. 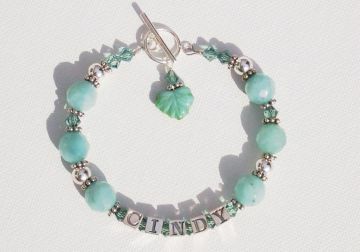 Show your support and make this bracelet for a loved one for friend. 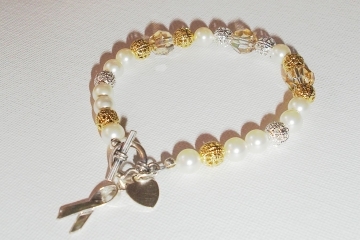 "Gold and Silver Awareness Bracelet" - Made with silver and gold plated beads, pearls, and champagne Swarovski crystals, finished with sterling silver awareness ribbon and heart charms. Show your support and love for any personal cause. 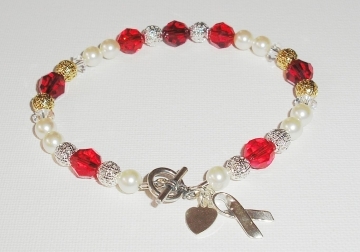 "AIDS or Heart Disease Awareness Bracelet" - Red Swarovski crystal beads with pearls accented by gold and silver beads, and an awareness and heart charm. The color red represents AIDS or heart disease awareness. "Robin's Egg" Oval turquoise bead and crystal bracelet - Features genuine turquoise beads and brilliant Swarovski crystals in rounds and cubes. 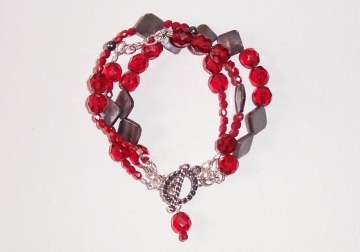 "Scarlet and Grey Bracelet" - Red glass crystal beads are mixed with charcoal pearls and shell beads with chain, in a random, triple strand design that grabs attention. "In the Forest" Yellow Turquoise Bracelet - This design features big nuggets of mossy yellow-green turquoise accented with lampwork glass beads and a smoky quartz bead charm. 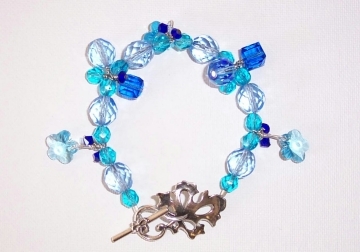 "Blue Waters" Blue Crystal Bracelet - A stunning bracelet full of bright blue color, in glass crystal beads and Swarovski crystal cube and flower bead "charms". 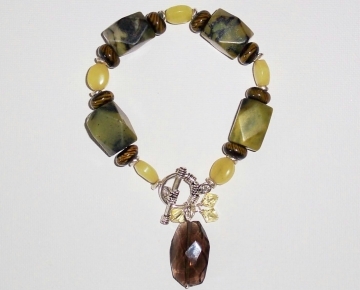 "Inner Glow" Tourmaline, Citrine and Crystal Bracelet - Simply spectacular! 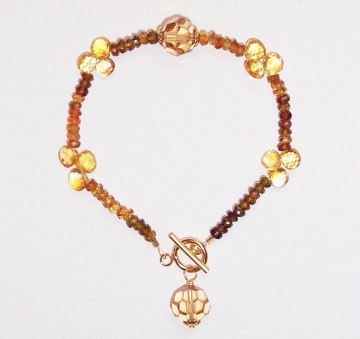 Sparkling golden light shines from this bracelet of genuine faceted tourmaline, citrine briolette, and Swarovski crystal beads. 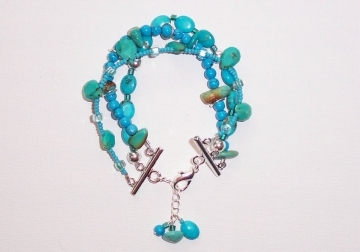 "Native Blues" Three-strand Turquoise and Silver Bracelet - Wow! 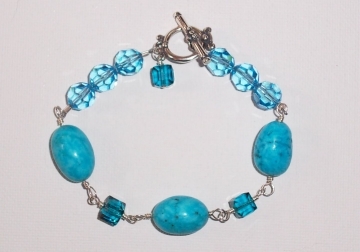 Three gorgeous strands of turquoise beads accented by silver beads make this great bracelet. "Pearl Slider" Seed Pearl and Turquoise Bracelet - This bracelet is simple and elegant. Made from white freshwater seed pearls and accented with turquoise beads and a sliding square pearl charm. With sterling silver toggle clasp. "Rustic Charm" Knotted Leather and Silver Bracelet with Turquoise Charms - Quick and easy to make, this simple design features leather cord, Bali sterling silver beads, and turquoise charms. 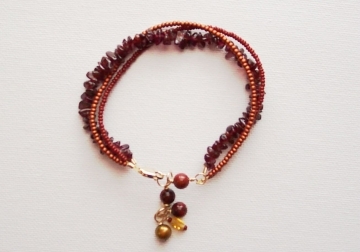 "Gorgeous Garnet" Three-strand Garnet and Seed Bead Bracelet - Triple strand bracelet in rich wine and copper colors. Made with garnet chip beads and seed beads. 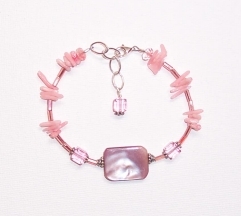 "Pretty in Pink II" Coral and Shell Bracelet - Luscious pink branch coral beads with crystal cube beads show off a center focal bead in pink mother of pearl. "I Love Mom" Personalized Mother's Bracelet - Alphabet name bracelet with gemstone beads and Swarovski crystals makes a great birthday or Mother's Day gift! 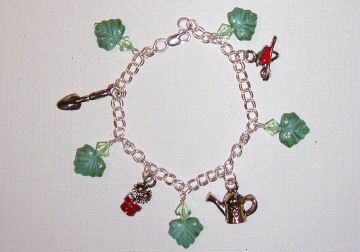 "In the Garden" Garden Charm Bracelet - A fun garden-themed bracelet with charms to put you in the mood for spring and summer. 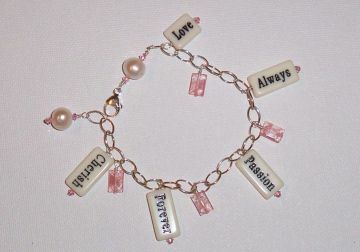 "Be Mine" Word Bead Charm Bracelet - Use inexpensive word beads to create a charming bracelet that sends a message. "Puppy Love" Personalized Pet Name Bracelet- This personalized pet name bracelet is a great design to make for the dog or cat lover in your life. 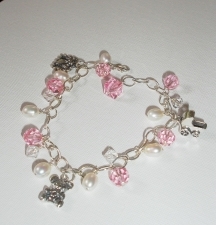 This is also a special way to remember a cherished pet, as a pet memorial bracelet. 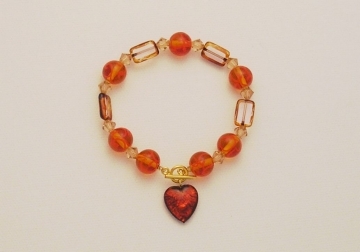 "Glowing Heart" Lampwork Bead Bracelet - Showcase your favorite lampwork beads in this great bracelet with a heart charm bead. Copyright (c) 2008 WebsiteName. All rights reserved.